Can you tell me any thing about this mark. It is on a vase which is said to be about 100 years old and is 15 inches high. I unfortunately don't recognize this mark. It is at least not an antique Chinese mark, but could possibly be Japanese, in which case I unfortunately still don't recognize where it could come from, the lower ? part that looks like a line figure could however be the number "6". As for a date of the vase, I suggest you carefully feel around the foot rim for remaining kiln grit (sand) stuck there from when the vase was fired. If the foot rim is so smooth you could safely put the vase on a polished mahogany table without a table cloth, you can assume that the vase has been around for more then 100 years since the base has been ground smooth just by being around for this period of time. If the foot rim still feels sharp, you could assume the vase is not that old. 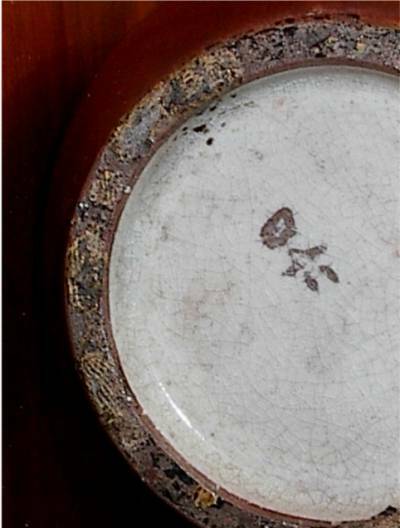 From this picture there is very little to base any opinion on, but for a wild guess into the dark, I suggest that you at least start by looking into Japanese Kyoto Satsuma from around the 1940s and base your observation more on the decorations, rather than this obscure mark.